Teak Patio Furniture, Indonesia has many creative and potential products that are loved by worldwide communities. One of the potentials is furniture product made of tropical wood. Indonesia is called as a tropical country that functioned as tropical trees habitat such as teak, mahogany, mindi, bengkirai, merbau, sonokeling, mango, coconut and more others. Those woods are able to be transformed into functional furniture products for indoor and outdoor usages. In term of outdoor furniture, the most produced wood material is teak wood. Teak wood has many characteristics to become its benefits in form of furniture. Teak has rich honey brown color, dense and straight grain, and oil content. 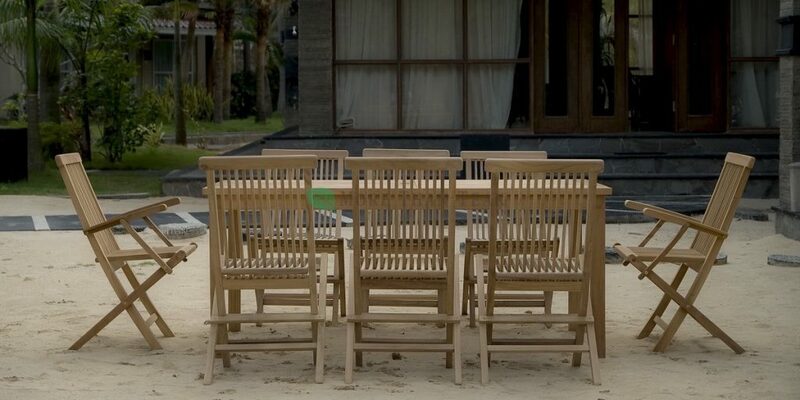 The combination of the characteristics make teak outdoor furniture has beautiful color, quality, durability, strength and withstand to termite, weather and fungus. Teak furniture would be ideal decoration for any outdoor spaces such as garden, landscapes, yards, parks, porches, terraces, or patios. It is available in many types of furniture so that whether the outdoor is transformed into living room, dining room or bedroom, it would look terrific and well-matched. The types of teak patio furniture are garden family sets, benches, dining table sets, bar furniture, swings, deep seating recliners, and chairs. A garden familiy set mostly consists of rectangular dining table and two benches on the side. They look stunning and functional to the garden structures attached. Teak patio furniture is mostly comes in unfinished as it has natural color as the asset of real beauty. With the natural color it has, it blends well to surrounding with the plants to make green areas nuance. With the help of teak patio furniture, homeowner will spend more time at their outdoor living with their favorite activities. It could be book reading, meditating, dining, children play supervising or enjoying the scenery. If you d not have any of them yet, grab teak furniture at local store fast. You will not be disappointed at all. This entry was posted in article and tagged Teak Patio Furniture from Indonesia.